Sometimes it’s fun to just work on a video game. Especially if it’s one for cats. We downloaded and bought all of the cat apps for the iPad, and our picky feline, Mango, got bored with all of them. The game he did go nuts over – Cut the Rope! So I decided to make game for Mango, and bring in some of the Cut the Rope style game play, like swiping and “swooshes”. Turns out, after some “beta testing” with my friend’s kids, that toddlers really like the game too. You know who didn’t like the game? Apple. 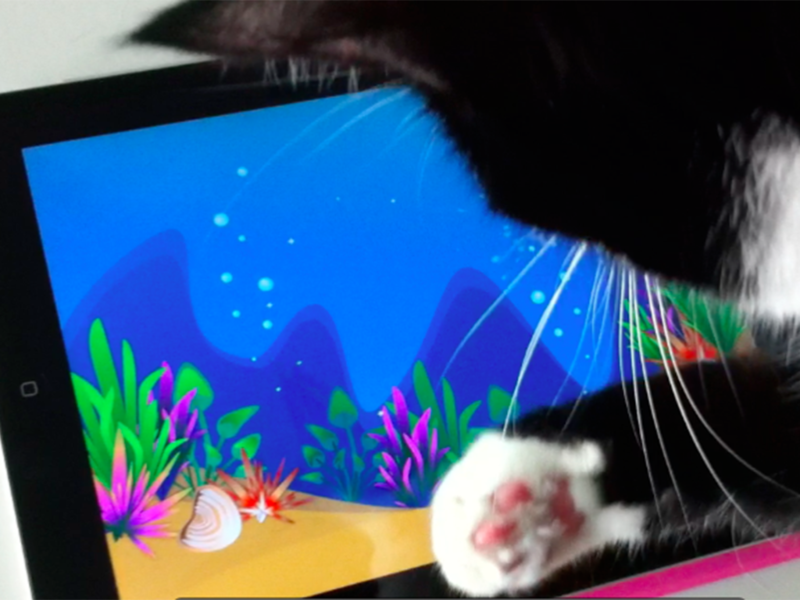 The first pass at the game got sent back to me for not having levels or scores…..well, it’s an app for cats, and they don’t know anything about game scores. Arguing with them was basically unlikely to get me anywhere, so I’ve revamped the game to have levels, scores, and GameCenter integration for a leaderboard. Of course, this adds some useless complexity for the cats, so there’s a mode where the cats can just play with no levels and no scoring. The app is currently out in beta testing, and should be in the Apple App Store in time for the Christmas holiday season. Goes great with an iPad mini!